Flags flew at half-staff and churches held special services Monday across Russia to mark a day of mourning for the victims of a plane crash in the Siberian city of Irkutsk that killed at least 124 people and left four others missing. Fifty-two people remained in hospitals after the airliner careened off a rain-slicked runway into adjacent garages on Sunday and burst into flame, said Viktor Beltsov, spokesman for the Emergency Situations Ministry. Seventy-five of the 203 people aboard the plane survived, he said. The catastrophe was the second major commercial airline crash in two months in Russia, and it was followed Monday by incidents involving three other Russian-operated planes, stoking renewed concerns about the nation's air safety standards. No one was killed in the latest incidents. Preliminary data gathered by the commission investigating Sunday's crash indicated that the braking system on the Airbus A310 operated by Russian airline S7 had failed, Russian news agencies reported, citing unnamed sources. Transport Minister Igor Levitin said the aircraft's flight and data recorders had been recovered and were being analyzed. The S7 press office said there were 193 passengers on the Moscow-Irkutsk flight Sunday, including 14 children, and a crew of 10. Emergency Ministry spokeswoman Natalia Lukash said three people whose names were not on the passenger list were pulled unconscious from the wreckage; it was not clear if they had been on the ground or were flying as unregistered passengers. At least 12 of the passengers were foreigners, from Belarus, Poland, China, Germany and Azerbaijan, according to the flight manifest. The plane veered off the runway on landing and tore through a 6-foot-high concrete barrier. It then crashed into a compound of one-story garages, stopping a short distance from some houses. S7 was known as "Sibir" until May. The Sibir blue and white logo was still visible on the tail at the crash site, reported CBS News correspondent Beth Knobel. Cranes could be seen hanging over the wreckage Monday, as several dozen investigators stood on top of what remained of the fuselage in a light rain. 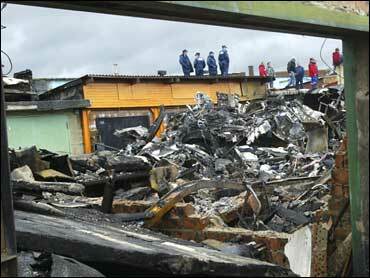 Charred and water-logged wreckage stood two stories high. A penetrating smell of burning hung over the scene. Relatives were arriving at Irkutsk morgues to try to identify the dead. Pilots regard the Irkutsk airport as difficult because its runway slopes and its concrete is especially slippery when wet, Vladimir Biryukov, an expert at the Gromov Aviation Institute, said on NTV. Irkutsk is about 2,600 miles east of Moscow. Levitin said authorities were looking into a proposal to lengthen the runway at the airport by a quarter-mile and he announced financing for resurfacing the runway. He also said that city authorities had been asked to determine whether the buildings the plane collided into had been constructed legally. Meanwhile, another Russian airliner, a Tu-154 operated by Urals Airlines, made a successful emergency landing Monday in Irkutsk after one of its engines failed, Beltsov said. An S7 Airbus A310 also made a successful emergency landing early Monday at the airport in the Ukrainian city of Simferopol following a technical malfunction, officials said. Several hours later, a Tu-134 plane carrying the Russian navy chief rolled off the runway in Simferopol and one of its two engines caught on fire, the Interfax news agency reported. No one died, but several officers suffered burns. In May, an Airbus crashed in stormy weather off Russia's Black Sea coast as it prepared to land, killing all 113 people on board. Airline officials blamed the crash of the Armenian passenger plane on driving rain and low visibility. Russian air safety standards plummeted in the years following the 1991 Soviet collapse as the state carrier Aeroflot split into hundreds of private carriers, many of which lacked funds to properly maintain and service their planes. Economic stabilization and the strengthening of official controls helped improve air safety in the 1990s and the nation's aviation safety record gradually returned to normal. Russia's oil-driven boom of recent years has bolstered the carriers' earnings and allowed many airlines to replace their aging Soviet-era jets with Boeings and Airbuses. Authorities have said, however, that some airlines weren't diligent enough about safety and called for stronger enforcement of official standards throughout the industry.